The « Green Cone » digester enables to compost all food waste from home, including meat, fish and dairy products, and this without any smell. Digestion represents the easiest composting technique that is. In fact, with the Green Cone, you just have to open the lid, deposit your food waste, before closing the the cover… that it ! 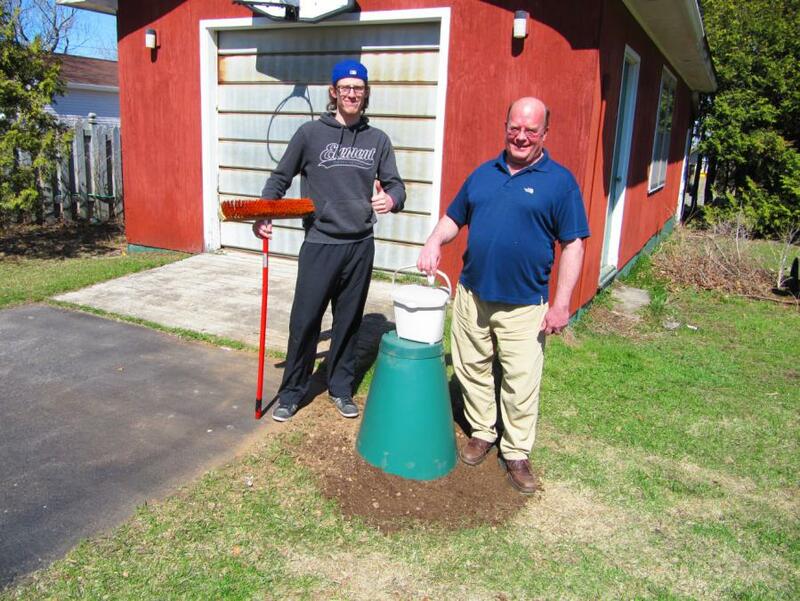 For the Chaleur Regional Service Commission, the Green Cone goes well with the blue bin. Indeed, with the implemantation of the alternated door-to-door collection of recyclables, some of our citizens were concerned that waste, collected every two weeks, would generate odors. With the Green Cone, there is no odor because the food waste is composted in the cone instead of rotting in the trash. We started to include the Green Cone to our composting program in 2013, right after the implementation of the door-to-door recycling pilot project in Petit-Rocher. Since then, we have sold hundreds of these digesters in the region… It should be mentionned that as part of our composting program, we sell the Green Cone at half price to those who participate in a workshop. If you questions or comments, you can write to info@CSRChaleurRSC.ca or phone to 725.2402 (888.820.5133).